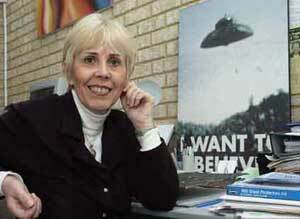 Mary is recognised Internationally, as one of Australia’s leading researchers in the UFO and Contact phenomenon. She has lectured in the USA, Canada, Hawaii, UK and New Zealand. She appears regularly in national and international media news programs and in documentaries such as Australian Documentary ‘OZ Files” and the BBC television program, “the “Paranormal Files” (UK.) and Discovery Channel Animal X. She has also participated in a University debate forum on this phenomenon, in 2006 at Oxford University, UK. Vice-President of Star Kids Project Ltd. Advisory Committee member of Exopolitics : www.etworldpeace.com Organiser of Perth’s First International Conference “Hidden Truth’s. Author of "Awakening: How Extraterrestrial Contact Can Transform Your Life" (2002) and the producer of the EBE award winning documentaries "Expressions of ET Contact: A Visual Blueprint?" (2000) and "Expressions of ET Contact: A Communication and Healing Blueprint?" (2004). Mary’s research records testimony from small children even younger than 2 years old, recall experiences on extraterrestrial space craft. One “eight year old” described a ‘downloading’ of information from the extraterrestrials, articulated by her as ‘knowledge bombs', i.e. Complex data conveyed through mental images and concepts, which seem to create a ‘heightened consciousness level.’ Research has shown the 'Star Children' exhibit a maturity and wisdom beyond their years, awareness and connection to spiritual realms. Mary’s research shows while many "Star Children" sometimes called "Indigo’s " have telepathic abilities, and are spiritually awakened and describe seeing "Beings of Light" (angels or light beings), the main difference is that "Star Children" have recollections of encounters with extraterrestrial beings and of being taken aboard extraterrestrial spaceships. Mary’s research also explores the evidence from scientific, biological, psychological, anthropological, spiritual and historical perspective to support what she believes is a ‘genetic’ engineering program, for ‘upgrading’ homo sapiens, leading to a paradigm shift in human consciousness, which these children demonstrate. Data suggests such children are being altered and transformed on many levels through extraterrestrial encounters. Mary’s research includes some of the latest DNA research which could qualify how this up-grading could and may occur.